DIMENSIONS: (h) 1.22m/48" x .61m/24" (w) x 3.05m/10’ wide total. 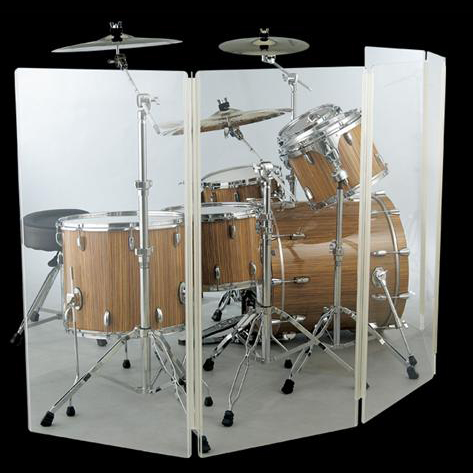 Designed to isolate the drums acoustically from the other instruments, made of clear acrylic, once assembled this will suit a 5/6pc set up. In the current high tech era, the science of live sound has grown prodigiously with advances in mic, speaker, monitoring, and PA technology, not to mention ticket prices. Backline amplification has shrunk as sound reinforcement has grown exponentially. This has led to a need to reduce the drummer's volume on stage on many venues, tours, bands, etc., without stifling his/her creativity and energy. Hence, audio prophylaxis for the drum set. To a soundman's delight, the assembled shield - made of clear acrylic panels - substantially isolates the drums acoustically from the other instruments.